Featuring: William Kunstler. Directors: Emily Kunstler, Sarah Kunstler. Warning: This movie will only be available for streaming until April 27th so act fast! We here at Netflix Stream like documentaries and we like people who stand up for what they think is right - even if no one agrees with them. 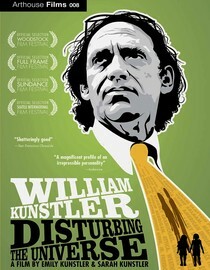 William Kunstler was an example of the latter and his daughters filmed a documentary about their controversial father. William Kunstler was an activist lawyer who never shied away from tough and unpopular cases. He became the prototype ACLU type lawyer that people love to hate. His career was remarkable. He rose to fame in the 60's after defending the Chicago Seven and seemed to be involved in every controversial case in America up until his death in the 1990's when he was the lawyer for the defendant in the original World Trade Center bombing in 1993. He also, at various points, defended the Cantonsville Nine, the Black Panther Party, the Weather Underground Organization, and was involved early on in the legal battles over segregation in the south. He was also the key negotiator during the Attica Prison riots and the Wounded Knee incident in South Dakota. He eventually even made it before the U.S. Supreme Court. In this documentary we look at the controversial Kunstler from the perspective of his daughters. These two girls must have had a crazy childhood. Protesters regularly camped out in front of Kunstler's home (which doubled as his office) and he was under constant FBI surveillance. It gave the documentary a personal touch which made the subject seem all that much more fascinating. This was an intriguing documentary and if you have any interest at all in the radicalism of the 60's and 70's or in U.S. legal history you'll enjoy this film. Love him or hate him, it's hard to deny that William Kunstler kept the system honest and for that I admire him. According to Netflix this movie will stop streaming 4/27/11. Of course, sometimes they lie. Why is it in your queue? William Kunstler was a fascinating character. Is it artsy? No, standard documentary format. What stood out the most to you? Finding out exactly how many big news stories he was right in the center of. What mood should I be in to watch this movie? Looking to learn a bit about history.